Almost everything about the Opticon OPN 2001 barcode scanner is small. It measures 1.2" x 2.5" x 0.63" and weighs only an ounce. It comes in a small box with the drivers on a mini CD. The only thing not small about the OPN 2001 is it's capacity. It comes with 512 KB of memory and can hold up to 10,000 barcodes. You can also forget about batteries. Unlike other portable barcode readers the OPN 2001 has a built in rechargeable battery which is recharged using the USB connection. The OPN 2001 is available for Windows only unfortunately. Installation is simple, you run the USB driver installer that is on the CD and plug in the scanner. Windows will install the scanner and you are ready to go. There is a PDF file on the CD in the USB Driver folder that explains everything you need to know. Note that the CD I received only contained Windows 32 bit drivers but the 64 bit drivers are available on the Opticon web site. Select OPN 2001 from the list to see all available drivers for the device. You can take the OPN 2001 with you in your pocket or hang it around your neck with the supplied cord. Take it to your bookshelves and scan away, there is no need to bring your books to your computer. To scan barcodes simple press the large button on the scanner. Position the scanner so that the red line pases through the barcode. The scanner will beep to indicate a successful scan. When you are ready to upload scans into Readerware, plug in the scanner with the supplied USB cable. To use the OPN 2001 with Readerware auto-catalog, start auto-catalog as normal and on the item input page of the wizard click on the Upload button. In the scanner upload dialog Select the Symbol CS-1504 scanner as the OPN 2001 operates the same way. Select the COM port assigned to the scanner. On my Vista system the COM port is displayed when the scanner is plugged in. You can also use the Windows Device Manager utility to get this information, this is all explained in the PDF document on your CD. Now click on the Upload button, the scanner will beep to indicate successful communication and the barcode scans will be uploaded into Readerware. You can optionally check the Clear scanner after upload box and Readerware will remove the scans after uploading. Or you can leave them in the scanner and delete them yourself by pressing and holding the small button until the scanner beeps. That is really all there is to it, the OPN 2001 is a very small scanner that can hold up to 10,000 barcodes. Keep it in your pocket and scan wherever you are and then upload the scans into any Readerware product. It is a very nice affordable scanner. The OPN 2001 is a batch scanner. This means that you can scan while disconnected from your computer and later upload the scans into Readerware. But you cannot scan directly into Readerware while connected. So you could not search for a book in your Readerware database by scanning the barcode with your OPN 2001. You can use your CueCat for that of course so an OPN 2001 and a CueCat is a great combination. 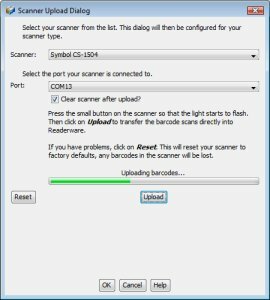 If you need a single scanner that can scan in batch mode and while connected, consider the LaserChamp II scanner. Find out more about the OPN 2001 at the Opticon USA web site. Ordering information is available here.